The term ‘trauma bond’ is also known as Stockholm Syndrome. It describes a deep bond which forms between a victim and their abuser. Victims of abuse often develop a strong sense of loyalty towards their abuser, despite the fact that the bond is damaging to them. When confronted with dangerous situations, the logical part of the brain – that thinks, reasons and exercises choice – is NOT the part of the brain that takes control. The response to threat is not logical. In reality, fear activates a more primitive part of the brain responsible for ensuring survival and fear chemicals suppress the part of the brain that makes logical decisions. The survival brain (or amygdala) is concerned with immediate survival, not long-term psychological impact. The brain will respond: ‘this won’t kill you, so freeze and endure it’. The more a person responds passively (enduring it), the more likely that this will become an automatic response when confronted with fear and sexual violence in the future. The main survival drive is to create attachments to others. This can create a very complex situation when the abuser uses both fear and a relationship with the victim, which can make abusive relationships so complex and difficult to understand to people outside of the relationship. 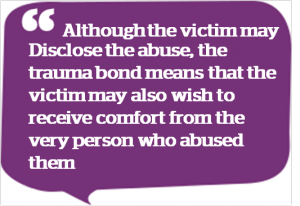 When an abuser hurts the victim, although the victim may disclose the abuse to third parties (such as family members, social care and the police), the trauma bond means that the victim may also wish to receive comfort from the very person who abused them. If the abuser re-bonds with the victim, it is likely that the victim will return to the abuser and cut contact with the third party. Any contact the child has with the abuser (even a text or Facebook message) can re-bond the victim to the abuser. Whilst it can be painful and frustrating to witness this situation, the fact that the victim has disclosed at all is a massive breakthrough. There is no easy answer, but to break the trauma bond a victim needs to have alternative healthy relationships available and be isolated from the abusers for a significant period of time. This allows the child time to heal and come to terms with the trauma they experienced, re-shaping the nature of future relationships. Observing this situation, particularly as a parent, can be heart-breaking, but the consistent presence of the parent and carer means that the child is not solely dependent on the abuser (which is what the abuser wants) and has a place of safety to flee to. If you are worried a child is in a possible abusive relationship or is at risk of child sexual exploitation, see Pace’s services for parents. Also sign up to our newsletter to be kept up to date on new developments and research in trauma.